Couples interested in unusual wedding rings don't have to opt for expensive designer pieces - there are many unique silver wedding bands that are gorgeous pieces of jewelry with equally attractive prices. Furthermore, silver wedding rings come in a wide range of styles, from classic bands to elaborate bridal sets. A simple, plain silver band can be customized with different widths or finishes, or couples can opt for more unusual designs. A channel set wedding band with cubic zirconia or diamonds is a classic style that is unusual to find in silver, though the silver band is no less beautiful than any other precious metal. 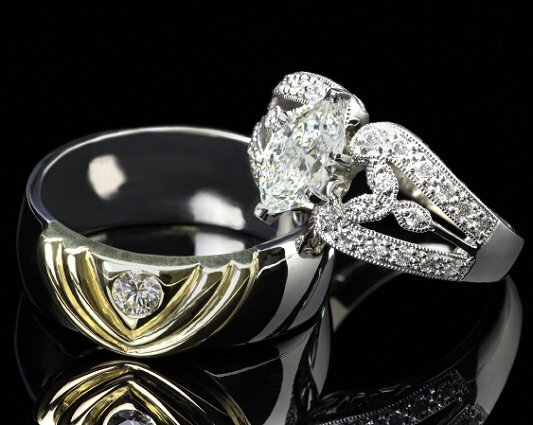 The width of the ring and the number of stones set into it can also vary for even more customization. A bride who wants to capture vintage elegance and romance can't go wrong with a Victorian-inspired silver wedding ring. Elaborately set with textural details this ring is stunning. Couples who want simple yet distinctive silver rings can consider a range of textures for plain silver bands. Checks, stripes, ridges, and deep etchings are all popular on silver bands, and combining more than one texture on a wide ring gives the design even more uniqueness. A braided has texture and unique beauty that is perfect with or without a coordinating engagement ring. This type of design is also highly symbolic, as the braid can represent two lives woven together as one. A simple silver wedding ring can be more unique if it is an unusual shape. A wide band with twisted layers and cut outs make for an unusual, yet elegant, option. Deep etchings across a thin silver band give the ring texture and dimension. Brass embellishments add details to give the ring a native look. This style is a good choice for someone who wants a more modern look. Celebrity-inspired rings are a unique choice for wedding bands, such as the famed Twilight ring with its vintage Edwardian flair. Other popular celebrity rings that can be found as silver replicas include Marilyn Monroe's eternity baguette ring and Princess Diana's classic sapphire engagement ring. Silver is highly malleable and easily carved, and it is not unusual to find wedding rings with multiple carvings on the ring surface. Slashes, starbursts, and other geometric patterns are popular and can be repeated around the circumference of the ring. A triple line of pave set gems or crystals creates an elegant, beautiful ring, and silver wedding bands can be set with stones just as easily as other precious metals. Couples should be aware, however, that because silver is a softer metal, it is more likely that stones may be lost over time, and a protection package or appropriate insurance is recommended. Art deco, wide bands with large cutouts are a daring, bold design. The open 'windows' lighten the bulk of the ring and offering balance to the wide band. Trinity wedding rings have three interlocking bands that represent a couple's past, present, and future together, or the couple may choose to have the rings represent the most critical part of their wedding vows, the "love, honor, and cherish" promises they make on their wedding day. Still another interpretation for this unique wedding ring is spiritual, with the bands representing the Holy Trinity. Couples who like the look of silver wedding rings but want more durable metals can opt for gold, titanium, or tungsten bands with silver braid or chain insets. This gives the ring a beautiful contrast that still highlights the classic look of silver.